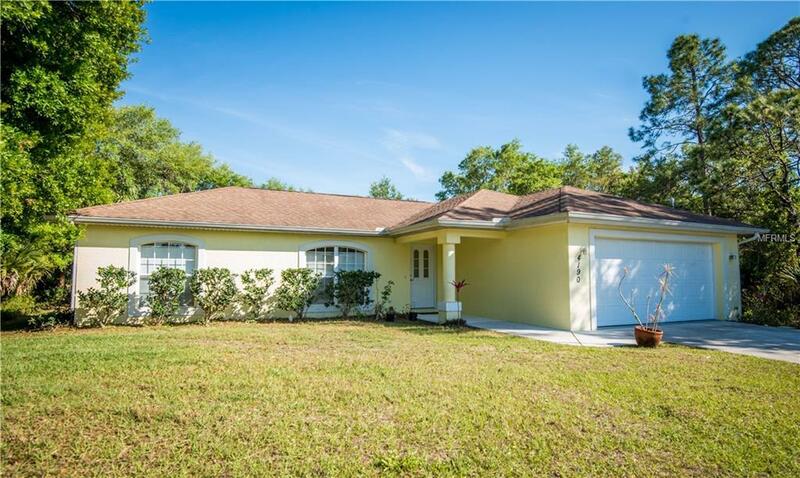 Home and land values in North Port are increasing and this is the perfect opportunity to own a well-built 3 BR/2 Bath/2-car garage home that will provide years of pleasure. This well-designed 2003 Windemere home sits between two vacant lots on each side affording you the added privacy on your lot surrounded with mature landscaping. Tiled throughout, accentuating the open floor plan are plenty of windows and voluminous ceilings that give the living/great room and kitchen/dining areas a bright, open and airy feel. The kitchen features ample cabinets, closet pantry and a window over the sink to savor the outside view. Enjoy your master bedroom ensuite and walk-in closet located on one side and two guest bedrooms on the other side. The inside laundry room is equipped w/d hookups. Relish each days sunrise with your morning coffee while birds serenade you on your spacious screened lanai. A backyard shed provides even more storage! Enjoy an abundance of nearby activities including shopping, canoeing, kayaking, biking, fishing, golfing, hiking and, of course, the pristine Gulf of Mexico beaches! Located close to US-41 and I-75, affordable and convenient flights are within reach from Sarasota, Punta Gorda and Ft. Myers. North Port is known for its great neighborhoods and excellent schools and as it continues to grow, more amenities are following. One of the states fastest growing areas, North Port appeals to growing families, snowbirds, commuters, and those fortunate enough to call Southwest Florida home!